All riders must fit into seats and restraints properly and hang on, sitting upright to ride. All riders must have armband, ticket or office pass to ride. No unpaid / un-ticketed riders. The only exception is the carousel. A parent is allowed to stand between horses and hold their child without paying. Safety regulations do not allow us to permit pregnant ladies to ride so not to injure the unborn child. 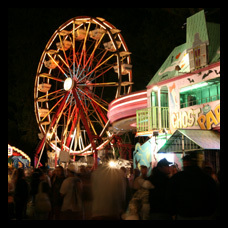 All rides have safety rules and guidelines and height restrictions. Please review them before purchasing tickets. Not all rides listed at any one location. Some people with casts or similar conditions can get a waiver from the office to ride. A minor must have a parent sign the waiver. Rider with cast will have certain restrictions as to what rides you can ride. Handicap or special needs – May ride if they can get on and off the ride and fit restraints properly, hang on properly. If they need assistance they must have someone with them that can assist and handle them as we are not trained. Whoever is with them must be responsible for them and be able to judge their limitations for appropriate rides. All of us here at Davis Shows Northwest, look forward to serving you with a safe and fun show. Check out our schedule to see where we will be next! Web Design by Activate Commerce.